when: Jun 25 – Jun 26 at 9:30 a.m. to 5 p.m.
It’s time to celebrate nature in the city. Why? Because why not! And you don’t have to plan it, so if it’s sounds like a cool thing you should not complain and just go. Explore LA’s wild side with this special event that includes 40+ exhibitors, hands on art activities, roaming performances, live animal presentations and photography workshops, behind-the-scenes tours and more. when: Jun 25 at noon & 2 p.m. The Skirball’s summer weekend Family Amphitheater Performances series debuts by showcasing the magical talents of Buyepongo, delivering irresistable dance beats that transport audiences to the tropics. I have no idea what this is, but it sounds super groovy to me. Inspired by the musical traditions of Colombia, Haiti, Belize, Honduras, the Dominican Republic, and Southern California, Buyepongo fuses merengue, punta, and cumbia rhythms with hip-hop, reggae, jazz, and funk. Shows take place at noon and 2 p.m.
when: Jun 24 at 6:30 p.m.
What’s better than raindrops on roses and whiskers on kittens? A screening of “The Sound of Music” where you’re encouraged to sing along. The 1965 Rogers & Hammerstein movie musical is shown in Technicolor and full-screen Cinemascope. Lyrics are projected on the screen during the movie so you can easily belt out “Do-Re-Me,” “Edelweiss” and “My Favorite Things.” It’s like TSOM Karoke! The Hollywood Hills are alive with the Sound of Music. Don’t forget to wear your best Drindl for the costume parade. 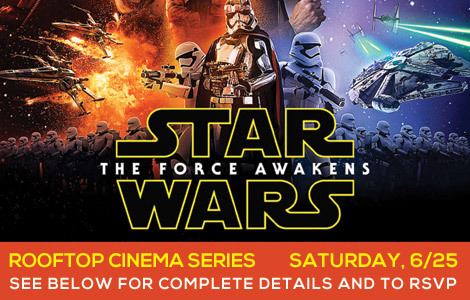 when: Jun 25 at 6 p.m. to 10:30 p.m.
See the epic space blockbuster Star Wars: The Force Awakens in a unique open-air setting. 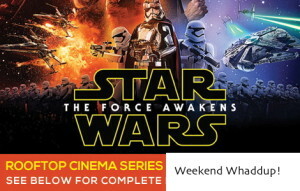 Because what’s better than Star Wars? Star Wars on a roof! Come early to enjoy the resident DJ and complimentary family-friendly activities including ping pong and hula hooping. Additional activities include a very special Star Wars themed costume contest with prizes and guest appearances from the Jedi Academy. Popular food trucks including the award-winning Slammin’ Sliders, beach themed eatery Woody’s Grill and Dogtown Dogs, who serve sophisticated variations of traditional favorites, will be on site with food and beverages available for purchase. Join a Topanga Ranch naturalist in this hike for kids and families. They don’t like to get all that verbose (not a dirty word, look it up if you don’t believe me) at the park service, but their tours are fun! Sing, dance, and clap along with Artichoke, a Los Angeles-based band (and a delicious albeit hard to eat vegetable) that energizes kids and families with lively indie pop tunes. Hear whimsical songs about animals and their habitats before wandering through the museum galleries on a wacky wildlife scavenger hunt! Wednesday 6:00 PM* to 8:00 PM, except during rain. Woodley Park Archers provide all necessary equipment and instruction. Students must be at least 9 years old. Equipment is given out in the first 30 minutes only. Arrive at least 60 minutes before class time to get in line and register or forget about it. There are lots of rules, but if you can’t follow a few rules you shouldn’t be playing with a bow and arrow!